It’s a new day for Oregon Ducks football with the 2018 recruiting class. One area at the forefront of this era is the offensive line recruits who have been signed and/or committed. Gone are the days of the long and lithe men up front who were the staple of the zone-read angle blocking schemes. They’re being replaced by a bigger body type designed to overwhelm an opponent by sheer size and mass. All of these new offensive line recruits are 6 feet 5 inches to 6 feet 7 inches and tip the scales at 300 to 355 pounds. 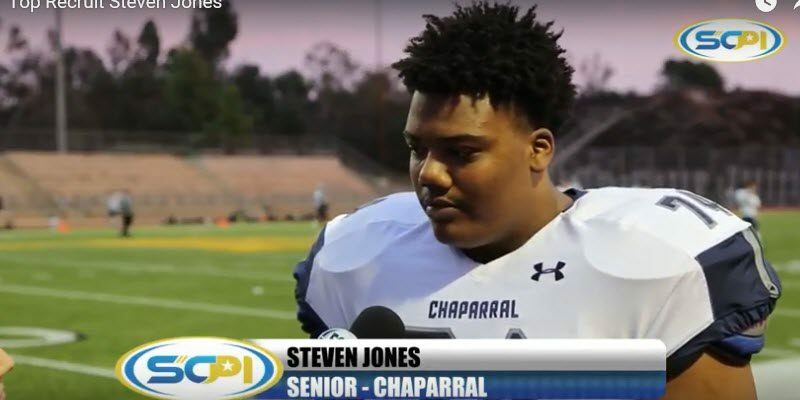 The crown jewel of this talented group is without question, Steven Jones out of Chaparral High School in Temecula, California. Jones ranked by ESPN.com as a 4-star recruit and the No. 272 player overall at any position in this recruiting cycle. And Rotoworld.com chimed in with their own opinion of him being rated a 4-star guard also. Various media sources list him at 6 feet 5 inches to 6 feet 6 inches tall and between 348 to 360 pounds. Andrew Nemec of Oregonlive.com describes him at the low end of this range at 6 feet 5 inches, 340 pounds, Rotoworld.com lists him at the upper end at 6 feet 6 inches, 360 pounds. However, the most reliable triangle numbers are always taken from a sanctioned event like The Opening presented by Nike Football where the athletes are measured and tested on the day they participate. At the Los Angeles regionals on May 21, 2017, Steven Jones was listed at 6 feet 5 inches, 348 pounds. I have not seen any information where his arm length or hand size was measured. However, a man of his size typically would measure 33 to 35 inches in arm length and his hand size would be well above the 9-1/2 inches average human hand size. His hands could easily exceed 10 inches. His SPARQ (speed, power, agility, reaction, and quickness) numbers are impressive for a man of his size. The SPARQ scores are geared towards a certain body type. Typically a running back, defensive back, linebacker, or receiver will score the highest because the scores are weighted towards body types that enable a player to be faster and jump higher. A SPARQ score of 100 indicates a great athlete. A score in the 125-130 is an athletic “freak of nature.” athletically. A score over 140 is rarified air and doesn’t happen very often. Steven Jones recorded 92.16 seconds at the May 2017 regionals. His score was slightly higher than uncommitted Oregon target Penei Sewell of Utah (91.77), and he led a small contingent of Oregon-bound offensive linemen Chris Randozzo (91.44) and Dawson Jaramillo (88.68). These are eye-opening scores for kids of this size. These young men are very good athletes. Steven Jones is a big-bodied guy who tested very well despite his mass. He is a dominant run-blocker, keeping the player he’s covering squared up in front of him. He blocks down the line and, when he gets out and pulls on a perimeter sweep, he displays some agility. In pass protection (Pass Pro), Jones is limited in that he doesn’t bend his knees well, keeping his back straight and in a “bendy” balanced position. He needs work on his hand punch and I see no evidence of a re-direct on any of his tapes. He progressed from his sophomore through senior tapes of keeping his hands in tighter with less clutching and grabbing. He is an imposing kid that just “rag dolls” opponents, especially speed rushers, though once in a while one will get inside on Jones and get him on his heels. Steven Jones blocks down the line and completely collapses the defensive line, in the video above. Here, Jones and a teammate demonstrate nice technique in a double-team block on the edge. Displaying his power, Steven Jones just “rag dolls” his opponent coming off the edge. There are several clips of him doing this on his tapes. Very impressive demonstration of strength. David Sharpe of the Oakland Raiders. Sharpe was taken in the fourth round (No. 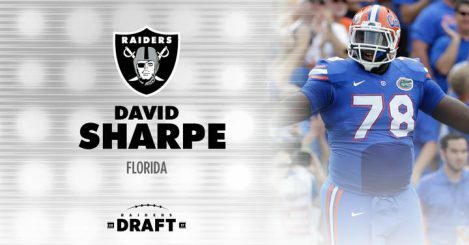 127 overall) of the 2017 NFL Draft out of the University of Florida. Both Steven Jones and Sharpe share similar size, testing results, recruiting pedigree and ability. Two other players at the NFL who are similar are Zach Banner of the Indianapolis Colts and Josh Garnett of the San Francisco 49ers. Banner was taken in the fourth round of the 2017 NFL Draft, while Garnett was selected as 28th pick in the first round. 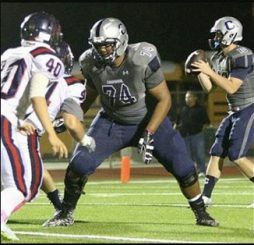 Steven Jones is a dominant run-blocker at the high school level due to his size. He gets out and pulls pretty well for his size; walling off defenders on the perimeter, or mashing them when they try to get across his outside shoulder to turn the play inside. He anchors well and is a tough, physical kid to bull-rush. A lot of work in pass protection. Where his size is an asset in the run game, it is a liability in Pass Pro. He appears to have “heavy feet” and this inability to move laterally with choppy steps on the balls of his feet is a liability. He appears to be stiff and struggles with a natural knee bend. 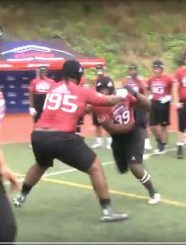 I saw little evidence of a hand punch except for this clip from a football camp (on the right), which is a required skill at the Division I level and beyond. Steven Jones has the size, athleticism and tenacity to be very good at Oregon. Certainly conditioning is an issue, and I think that he will be a better player if he loses some weight and plays at under 340 pounds. I looked at approximately eighty NFL offensive guards, from 2014 to the present, and only found two that were over 340 pounds. With the caveat that he gets in better condition, Jones should see the field early in his career for the Ducks and has the talent to be an All-Pac-12 guy and future mid-round pick in the NFL.